CBDT has recently notified new form 12BB to claim a tax deduction on LTA (Leave Travel Allowance), HRA (House Rent Allowance) and Interest paid on home loans. As per new rules, you need to submit your proof of travel in new form 12BB for claiming LTA benefits. In addition to this, you need to furnish detail of HRA and deduction of interest borrowing in the same form. This new notification is applicable from 1st June 2016. Earlier also employers were taking a declaration from an employee. However, there was no standard format for the same. Introduction for this new form will standardize the process. How to fill up New Form 12BB? You need to first furnish your name, address, PAN card number and financial year in the form 12BB. After furnishing this information you need to go to the respective section and fill out information. Under House Rent Allowance section you need to provide information like rent amount paid to a landlord, name of the landlord, address of landlord and PAN card number. Permanent Account Number is required only if the aggregate rent paid during the previous year exceeds one lakh. Under this section, you need to just furnish amount and provide evidence of expenditure made for Leave Travel Assistance. In this section you need to provide Interest amount payable/paid to the lender. Along with this you need to furnish information like Name, address and permanent account number of the lender. In this section, you need to provide information about investment and expenditure made under various heads. Under section 80 C you need to write investment type and amount. In section 80CCC and 80CCD you need to write amount. If you have made expense under section 80E, 80G and 80TTA you also need to mention it. After filling up all these information you need to write your name and provide declaration. How Salaried Person can maximize tax saving? 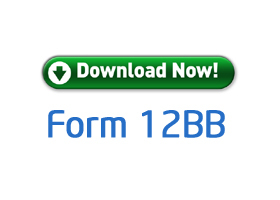 When should the employees submit this form 12BB to employer. If employee need to change the declaration what needs to be done. Your employer will ask form 12BB. You can revise the Form 12BB till the last date specified by Employer. If rent amount does not exceed 1 lakh, so we need to mention those details right? But we can fill the details of section deuduction under section VI A ? Yes Karthika, You can fill the details under section VI A.However, you need to mention the detail of Landloard this will help incometax department to track the detail. Form 12BB will be with employer or need to be submitted to tax department? How this form will help to avoid fake claims? This form 12BB will be with employer.Employer will submit the same to Income Tax Dept.Employer will check proof of investment while you submit form 12BB. Dear Supriya, LTA stands for Leave Travel Allowance. It is amount given by employer to employee for leave travel. Leave Travel is allowance given by Employer to employee. With regard to PAN of Landlord where the rent amount exceeds one lakh per annum. What if the Landlord PAN is not available ? Can the Assessee submit the NO-PAN declaration ? In case your landlord does not have PAN card.He/She need to give declaration that he/she is not having PAN card.